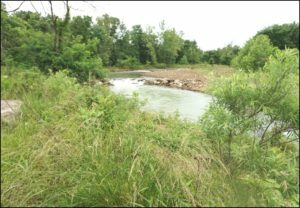 The Watershed Conservation Resource Center (WCRC) worked with local landowners and partners torestore a 1,800 ft section of the West Fork White River (WFWR) near Brentwood, AR. A natural channel stream restoration design was developed and implemented for the unstable section of river. The project was funded by an EPA Section 319(h) grant administered by the Arkansas Natural Resources Commission with matching funds provided by project partners. The project was initiated in 2007 and the stream restoration construction activities were completed in September 2009. The WFWR is a major tributary of Beaver Lake, which is the primary drinking water source for over 400,000 Northwest Arkansas residents. In 1998, the Arkansas Department of Environmental Quality (ADEQ) placed the WFWR on the 303(d) list of impaired water bodies citing the cause of impairment to be excessive amounts of siltation. The stream remains listed today, and a 2004 watershed assessment showed sediment loads from accelerated streambank erosion to contribute 66% of the total sediment load for the WFWR. Based on a study conducted by the WCRC, the site was a high priority for restoration. 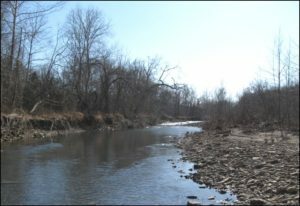 Streambank erosion measurements taken prior to implementation of the restoration design found average lateral erosion rates as high as 13 feet/year, resulting in approximately 1,960 tons/year of sediment that entered the WFWR for an average flow year. The WCRC utilized a natural channel design approach to reduce streambank erosion and sediment loads and improve aquatic and terrestrial habitats. The stream channel dimensions were designed to restore the river to a more stable form based on local reference reach data. The new channel design located the river away from severely eroding banks and eliminated abrupt bends in the channel. Structures made of natural materials were constructed to deflect higher velocity flow toward the center of the channel, reducing near-bank shear stress and minimizing erosion. The old channel was converted into a series of four settling ponds that act as ephemeral wetlands. The wetland area provides storage, habitat, and filters storm water from an adjacent state highway. Following storm events, water is retained for several days as it slowly infiltrates through the soil and gravel substrate. During construction, disturbance to existing vegetation was minimized to keep mature root mass intact for additional bank stability. As the new channel was constructed, the topsoil was stockpiled and later distributed throughout the site at the end of construction process in order to provide a healthy growing medium. Native plants were harvested from the project site prior to construction activities and were replanted throughout the site. Sod mats, layers of soil and live vegetation taken from the fringe of a nearby pasture, were placed on top of the constructed bankfull benches providing instant erosion protection and plant growth. Hundreds of native trees, shrubs, and grasses were planted and native grass and wildflower seeds were distributed to provide erosion control, improve the riparian areas, and enhance the terrestrial habitat. Several high flow events have occurred since implementation and the site has met project objectives. A catastrophic flood event occurred in April 2011 and the restoration provided protection of an access road, a residential structure, and unmarked graves while preventing land loss and thousands of tons of sediment from entering the stream system. The project suffered some damage, and project partners contributed funding to implement repairs which were completed in December 2012. Through this project, accelerated streambank erosion has been eliminated; aquatic habitat has been improved; the riparian areas have been enhanced; and sediment loadings to the WFWR have been reduced by over 96% improving the WFWR and Beaver Lake’s water quality.